This post is sponsored by National Debt Relief and may contain affiliate links. Debt. It’s an uncomfortable topic that most people don’t like to discuss, and even more so for those who actually have it. From never-ending student loans, mortgage payments to a multitude of other things to pay for, it might sometimes feel like the only way to get by is with credit cards and loans. Actually, even I am guilty of this. And thanks to my credit cards, I once had a lot of debt and had no idea how to get rid of it. Two years ago when I experienced my first job lay off, my whole life turned upside down. We were given a mere one-month notice, and I didn’t have any feasible savings to live off during this sudden state of transition. The timing was awful: at 22 years old, I was taking the first step into adulthood by parting ways with my parents, and I was barely adjusting to monthly payments on things like my cell phone service, auto insurance and rent. So when I got laid off a job that barely made me enough to cover all my bills, I was terrified. My job at the time paid a small sales commission plus hourly minimum wages, but I only worked part-time. So once I filed for unemployment, the benefits I was granted barely matched my income – I didn’t even have enough to cover all of my expenses. So I resorted to using my credit cards. Prior to my lay off, I had several credit cards with pretty high limits for being in my early twenties. I used to pride myself on this until I shot myself in the foot by running my balances sky-high during my period of unemployment. During this time, I started a nasty habit of treating my credit card like my debit card and slipped into major denial of my financial crisis. I had a hard time finding a new job and didn’t receive enough income – how was I going to pay off all this growing debt? I pretty much continued living as if I still had an income, although I didn’t. I was living purely on my credit cards and as a result, I accumulated nearly $10,000 of credit card debt in just a few months. I knew I had a problem, and I didn’t know how to fix it. Eventually, I finally got a full-time job – albeit with minimum wages – and proceeded to chip away at my credit cards. After a full year’s worth of work, I finally paid off the behemoth that was my debt. Sounds like a happy ending, right? I thought it was… until I faced yet another department closure and I was laid off a second time. This time, my department was sent home that same day with our last paychecks in hand. And the cycle of living off credit cards began again. In a perfect world, we would all like to claim we are responsible with our money, but no matter how responsible you are, life just happens. Financial crises like mine happen to tons of financially responsible people out there, and while most might recommend saving up to avoid these kinds of situations, what can you recommend to others who don’t make enough money to put away for savings? Sometimes you will incur debt, and that’s okay. It doesn’t mean you are a bad person or a failure. What does matter is creating a plan to pay it off. So how do you pay off debt that’s 5-6 figures? Here 5 ways you can pay off your debt this year – some of them I have successfully used myself! The first tip anyone will tell you is to stop spending, but let’s be honest: even if you stop unnecessary spending altogether, what can you do if you still don’t have enough to make ends meet? The only solution is to increase your income. I’m not going to ask you to stop spending, because that is much easier said than done. However, it is important for you to track your spending. This means writing down your purchases, saving all your receipts or even creating a spreadsheet to log your expenses. Seeing your expenses in this light will definitely make you more aware of your spending habits and help you see your wants vs. needs much more clearly. Start the healthy habit of living within your means. You’re already in debt, so why continue accumulating more? Stop spending money that isn’t yours and start spending the money that is – that means using cash and sticking to your debit card. It can be a painful transition, but unless you want to effectively pay down your debt, it’s a necessary move. 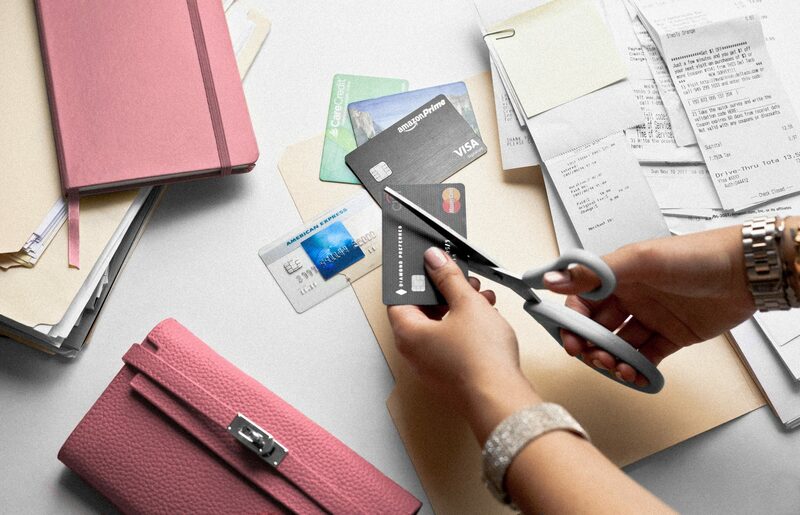 Consider putting your cards away in a safe or even cutting them up if you want some finality. The debt snowball method is one of the most effective ways I used to pay down my debt so quickly. Using this method, you simply focus on paying off your highest existing credit balance using large payments and then move onto the next largest debt once you paid one off. For example: if I have 3 credit cards with a $10,000 on one, $5,000 on another, and $1,000 on the third, I would focus on making as large of a payment as I can manage on the $10,000 one each month and pay the minimum monthly amount on the other cards. This allows you to quickly pay off your debts one-by-one while keeping your credit score safe, as this assures you are making payments on all your debts each month and not becoming delinquent. Maybe you got laid off just like me, experienced a death in the family, or had another pivotal life-changing hardship that prevents you from climbing out of debt. That’s okay. Sometimes you need to find reliable advice that can you can count on to make the decision that’s best for you. Before seeking drastic options like filing for bankruptcy, consider seeking debt settlement if the above 4 options aren’t feasible for you. If you have a lot of debt from credit cards, personal loans, medical bills or even private student loans, National Debt Relief is a great debt settlement program that may possibly suit your needs. When working with National Debt Relief to settle your debts you may become debt-free in 24-48 months with absolutely zero upfront fees. Not only that, but you might also wind up paying significantly less than your current debt, and that’s including their fees. With National Debt Relief, settling your debts is as simple as making one low monthly payment into an FDIC insured trust account. The money collected gets disbursed only when negotiation is reached with your creditors and you agree with the settlement offer. These monthly payments are usually lower than what people currently pay monthly towards their debts. Not all debt is one and the same – each person’s debt varies from one person to the other, which means you need the solution that’s best for you. Whether you’re able to take the do-it-yourself method or willing to pursue debt settlement, make sure that 2018 is the year you finally get out of debt. Want more budgeting and personal finance advice? Subscribe to my newsletter below and get more financial tips and tricks via email. I love love love this article. I read it multiple times a day to remind myself YES I CAN GET OUT OF DEBT! Your blog is the most inspiring blog I have ever come across. Your honesty and candid posts make me feel like I know you.